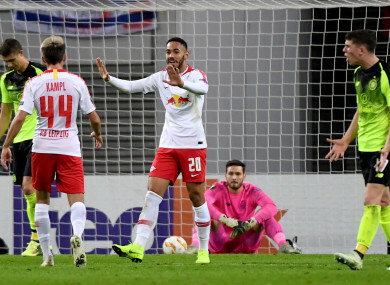 Brendan Rodgers’ side were beaten 2-0 by RB Leipzig. Matheus Cunha gave the home side the lead. CELTIC’S CHANCES OF reaching the Europa League knockout stages took a further hit on Thursday as they were beaten 2-0 by RB Leipzig. Brendan Rodgers’ men left it late to get the better of Rosenborg in the opening round of matches before being beaten 3-1 in Salzburg last time out. Bruma’s goal followed four minutes later as he reacted quickly to punish some more suspect defending from the Scottish champions. Email “Celtic's Europa League hopes dented by defeat in Germany ”. Feedback on “Celtic's Europa League hopes dented by defeat in Germany ”.